Martin Grubinger does his incredible stuff! 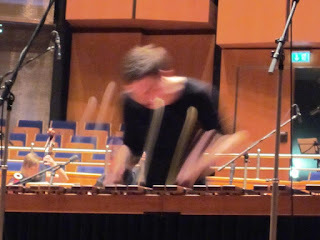 The 'Transatlantische Festovertüre' at the Tonhalle, opening the Schumannfest last week, was such an incredible experience I had a lot of trouble starting this write-up. It's very difficult to find the words that can mirror that feeling of pleasure I experienced that evening. Trusty to the programme's name, the musical travels I experienced were far-reaching and exhilarating. The Grammy-winning Emerson String Quartet opened with a wonderfully romantic piece from Schumann, many warm pictures of nature's joyful peace and playfulness came to mind. After the break, the Quartet pushed forward the concept of crossing over new boundaries to undiscovered territories; for example, I later found out that Samuel Barber's heart wrenching composition (recognizable from a war movie's soundtrack) was a regular at funerals for high dignitaries. The highlight of the evening: watching 'the Conjurer' call forth evil spirits, remains indescribable for me. 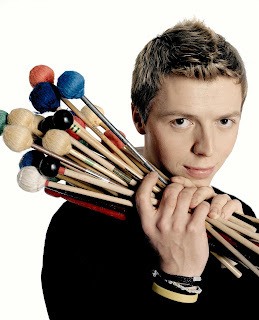 Casting his magical spells, one of the world's fastest percussionists, Martin Grubinger, had the entire audience spellbound as he raced around the stage playing an undefinable number of instruments. If I distanced myself from the depth of the music for a moment, his enraptured playing was enthralling in itself. With his incredible talent and passion, he successfully charmed forward the glassy-eyed smiles of everyone there. Ending the trip, the young and enthusiastic Salzburg Camerata performed the swirling 'West Side Story' suite, that city-bustling, emotional journey of the heart and mind. There were numerous charming surprises in this performance and the encore had the audience singing "Amen" in true gospel style. Another truly unique magical moment. Here, the transatlantic destination to the new world had been reached. The influential Robert Schumann was the beginning of a new romantic revolution, and being so, this concert was the perfect way to begin this festival. I'm looking forward to many more pathways at the Schumannfest to journey along to.